The pressure to be perfect can stop us from putting our ideas on paper—or screen, as the case may be. Today, I want to break out into a short episode to talk about writing strategies and tips you can use if you are a small business owner. 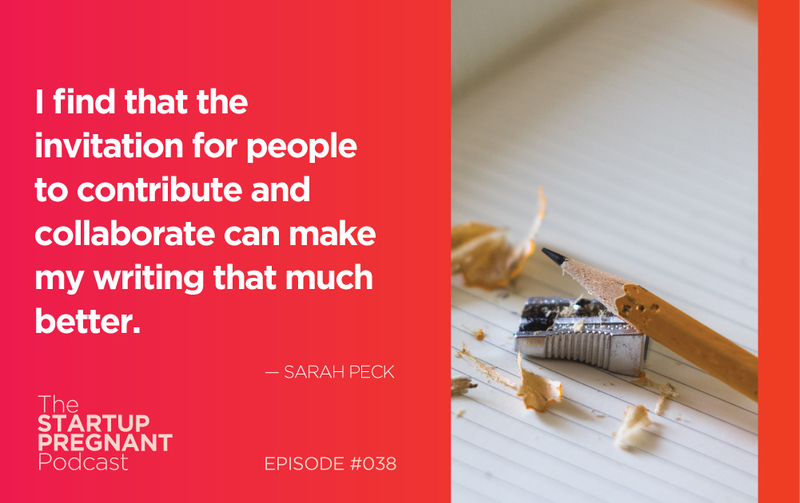 In the last episode with Tara Gentile, she shared an awesome tip for how she frames writing as the beginning of a conversation (listen to Episode #037 here). If you’re new to Startup Pregnant, welcome! We’re a weekly show that airs every Monday with a long-form interview, featuring pioneering women, entrepreneurs, and parents. And this month, I’m doing an experiment with the show — for the month of March 2018, I’ll be sharing a short, 10-15 minute mini-episode that follows each of my long-form interviews. These bite-sized episodes will be focused on a specific tool, strategy, or idea that you can immediately put into practice, often related to something a guest and I talked about in the longer interviews before. In Episode 37, Tara Gentile described her ‘call and response’ approach to the writing process. Today, I’m digging into this concept, explaining how collaboration makes my writing better. I also walk through the three phases of the writing process, describing how each piece requires a different part of my brain and why it’s useful to separate ideation, execution and editing. Listen in as I break down the writing process, offering tips and tools to help you start a conversation of your own.